I covered a piece of paper with aluminium tape and embossed it with a Tim Holtz stencil. I decided not to grunge it with anything, the shiny metal looks fun with the pink non-pigmented critter. 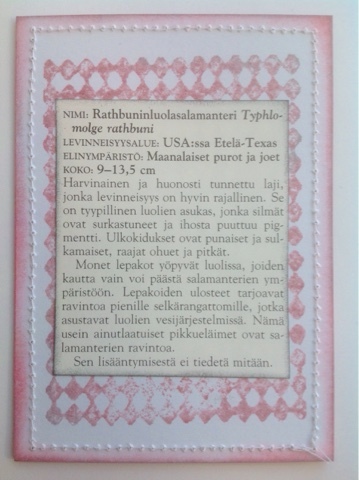 As you can see, Finns love to combine words if they initially belong together... "rathbuninluolasalamanteri" is quite a long name but means "the cave-salamander of Rathbun (or Rathbuni)". Wikipedia didn't give a clue about Rathbuni: place or person?!? Below you can see the back of the card with the description. The letter stamp and the harlequin background stamp are both from Rubber Dance Art stamps. I love that your industrial background looks like water bubbles too. I need to make that background for a fish card. That name is as long as its critter is! LoL. It's early in the morning here and I've learned a new word today. Don't I feel so smart now! Love the background. What an odd looking creature - I am discovering animals I never knew existed thanks to this challenge. that is one very long word, almost as long as that salamander. Not sure if I could actually pronounce that word! Like the reflective and textured background. I so enjoy visiting and learning new words when I visit your blog. 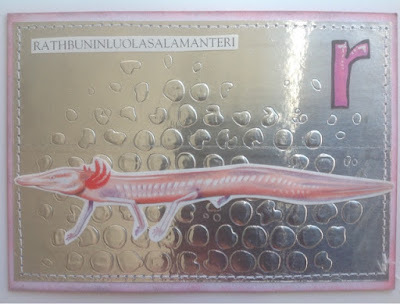 I may never be proficient in the Finnish language, but if I ever run across one, I will know how to say salamander! Great art because I adore that metal tape background. How clever to get this one entered in both challenges! Your salamander looks great on the metallic background. What a fantastic word!! Love the contrast here, thank you for entering The Craft Barn's Challenge. Lovely background to show off the salamander.